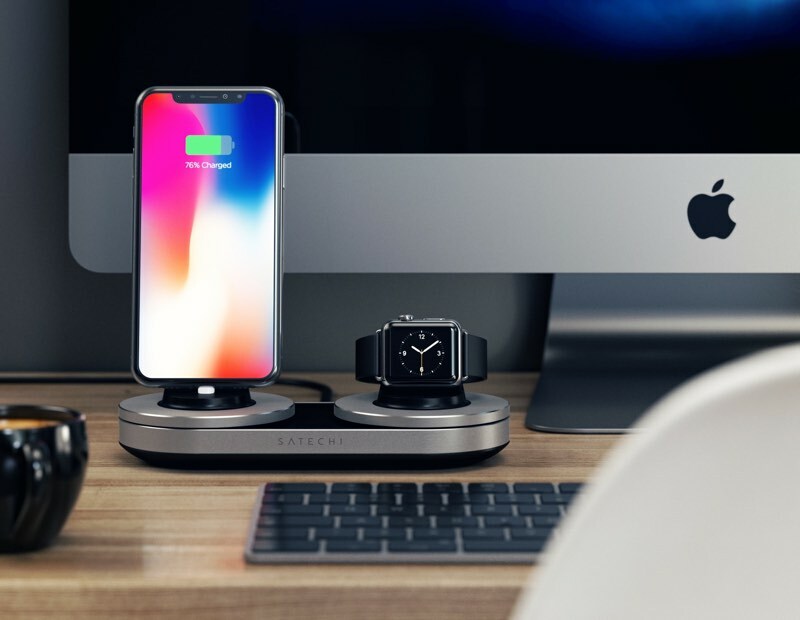 For this week's giveaway, we've teamed up with Satechi to offer MacRumors readers a chance to win a USB-C Dual Charging Station that's designed to charge the iPhone and the Apple Watch at the same time. 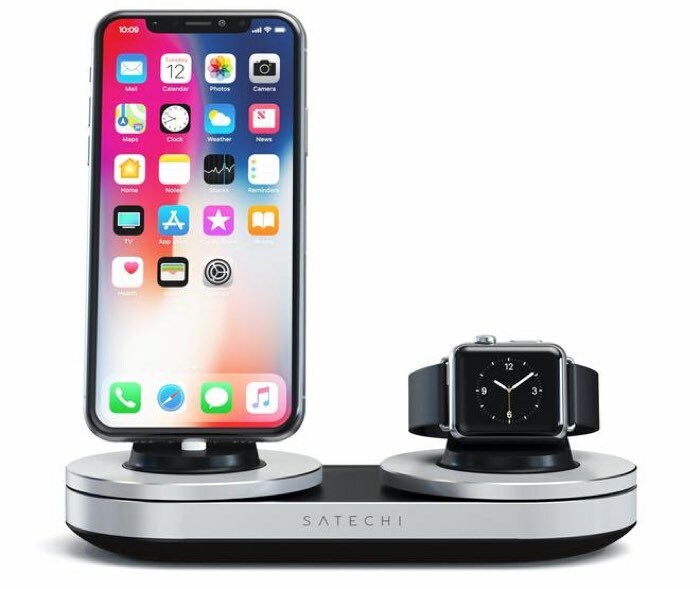 Available in Silver or Space Gray to match Apple's devices, Satechi's Dual Charging Station provides a total of 15W of power to charge an iPhone and an Apple Watch. The Charging Station, priced at $64.99 normally but on sale for $38.99, features a slim, attractive design with a pedestal for each device, holding both the iPhone and the Apple Watch upright for easy viewing. You'll need to supply your own cables for the iPhone and Apple Watch, but the Charging Station includes built-in cable management features to wind up excess cable. It comes with a USB power adapter and a USB-C to USB-A cable. Satechi has designed the charger with smart charging technology that will provide the proper amount of power to each of the two devices that are being charged. It works with all modern Apple devices that have Lightning connectors, along with the Series 1, 2, and 3 Apple Watch models. We have five of the Dual Charging Stations to give away to MacRumors readers. To enter to win our giveaway, use the Rafflecopter widget below and enter an email address. Email addresses will be used solely for contact purposes to reach the winners and send the prizes. You can earn additional entries by subscribing to our weekly newsletter, subscribing to our YouTube channel, following us on Twitter, following us on Instagram, or visiting the MacRumors Facebook page. a Rafflecopter giveawayThe contest will run from today (November 23) at 11:00 a.m. Pacific Time through 11:00 a.m. Pacific Time on November 30. The winners will be chosen randomly on November 30 and will be contacted by email. The winners will have 48 hours to respond and provide a shipping address before new winners are chosen. So no Apple watch 4 use? Why? Embarrassing chinese plastic garbage. Something like that was chic in 1978. 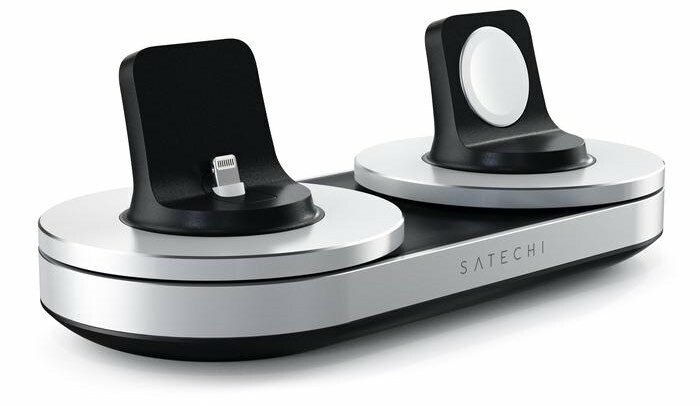 "I proudly display my Satechi stuff..."
Wow you have some strong feelings against Satechi, have you used this dock yet? Why should I? You don't have to reinvent the wheel. Apple has already elegantly solved the power supply. The problem with a lot of these docks is they won't accommodate a phone that's inside a thicker case, like most wallet cases. So this would work for my wife, but not for me. Do you have a link to the one you are using? I bought mine months ago off eBay for I think $12. Not the same company but appears exactly the same. It did come with one bad charging cable but I switched it with one I already had. Looks and works great. Sounds like you're saying Apple "solved" the charging solution by just making charging cables and the watch charging puck? Some of us actually DO like having a charging dock/station. I've got a nice one, from China, that charges my watch, phone, and AirPods in a metal frame with a small footprint that is the same space gray as the rest of my devices. It looks great on my desk and unclutters all the cables. "Yes, this is compatible with the Apple Watch Series 4." His question was reasonable. One would expect a reputable company to update their specifications in a timely fashion.